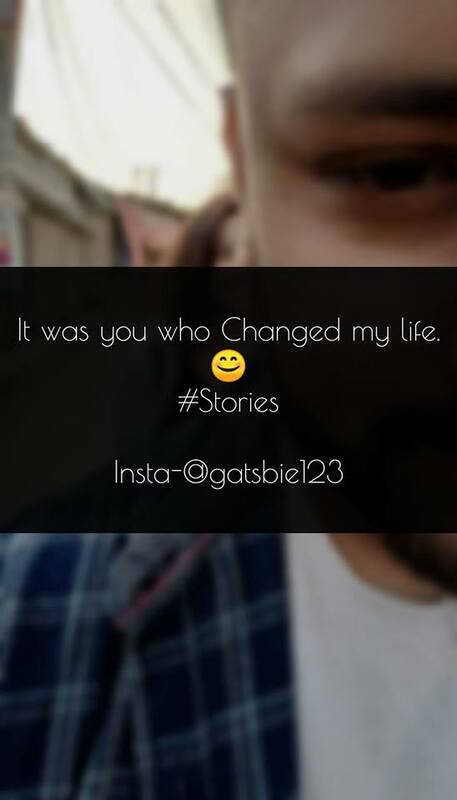 IT WAS YOU WHO CHANGED MY LIFE ! From the past 3 months, I prepared myself to be an introvert. I already accepted the fact that there’s no such thing as forever and especially when it comes to relationshits. Quite pyscho right? But that’s how my mind worked until I met you. You, the most unpredictable part of my life. The person who somehow changed the way I see things. The way she changed the form of Relationshit=Relationship. I just want you to know that I am overwhelmed because it's of you. It is you who brought me to a whole new world. A world where my doubts and fears seemed so tiny as if they were never there. It is you who made me realized that taking risks does make a person stronger because I broke out from my own circle of imagination. It is you who made me feel beautifully happy, the kind of happiness I never thought I’d be able to experience again. It is you who made me feel human again, who taught me that it’s all right to show my love to someone who really cares, that my imperfections make me more beautiful as a person. It is you who made me realize that I don’t want to be alone. She is always with me in every step of my life. It is you who made me realize that every story which I wrote was above the level and they are touching. It is you who made me feel those butterflies in my stomach. The way you stalked at me and that prettiest smile across your face makes me want to hug you right away every time I see you. It is you who made me feel loved and appreciated in every way you do. It is you, my answered prayer. The one God allowed in my life. The cause why it never worked out with anybody else. The person whom I want to spend the rest of my life is just you. WHY YOU HAVE TO LIST YOUR PROBLEMS ? A problem well described or stated is actually a half solved itself. The list will be more special if you point out your problems on the list on a piece of paper. Your problems will be automatically turned into a lighter weight if you share that with your siblings and best friends that have been troubling you for a few days or weeks or maybe months, too. You will feel like your mind is being more enthusiastic in days calling. You really feel freer, calmer and lighter. It doesn't mean that your best friends can't be your worst enemies. Such like that, when you managed to make your mind best friends that can be turned into worst enemies in the future sooner or later. If you keep focusing on your problems about how to tackle this, pretty soon you gonna think about little else. The mind is a special strange creature in this regard: the things you more want it to memorize, it forgets, but all those memories or things you more want it to forget, it remembers. This is quite funny. Our mind always tries it's best to play with our feelings, emotions, and life in case of memories. To let go of the mental cover that your problems tend to create automatically, list out all your problems or worries on a piece of paper. If you do so, they will no longer be able to become septic in your mind and void your precious energy. This simple tactics or tricks will also permit you to put your problems into perspective and gear them in an orderly,well-planned sequence. 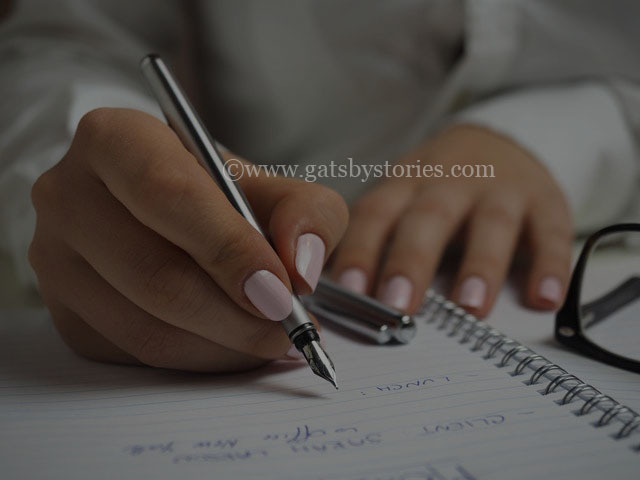 Among the many successful people who have used these tactics are martial arts master Bruce Lee and Winston Churchill, who once said, "It helps to write down half a dozen things which are terrifying me. Two of them say, disappear; about two, nothing can be done, so it's no use worrying, and two perhaps can be settled." BOYS,TOO HAVE A PROBLEM ! This is related to one of my relative who married a very pretty girl. She was so damn pretty that everyone was wondering how this guy got so lucky. Anyway, after a few months of living together, there came the judgment day. Things weren't going well between this pretty lady and her in-laws. No, her in-laws were down to earth human beings. So technically, there had to be something serious. One fine day she asked her husband “ Choose between your parents and me!! I want to live away from all this stupidity and people without common sense.” He was devastated. Did he leave his parents? Yes, he did. A few months later, he got busy with his new startup and started coming home late. There were problems again. “ You're not taking me anywhere these days because of that useless startup of yours. Choose between your business and me! Else I'm going home to my parents”. Did he leave his startup? He left his dream behind and settled for a monotonous job. Next, this man was close to a girl and a guy from his college days. They were his best friends. He used to share his tragedies with them. One fine day his wife said “ What's your problem. Am I not enough for you?" Why do you want them? You keep talking to them all day! Choose between them and me! Else I'm going home”. This was it. She's living with her parents now. The guy is busy running another startup with his best friends and going back home for dinner with his parents. He's at peace. So what makes a woman unattractive?? Her inability to understand the dreams, passion, and emotions of her soulmate. A relationship ain't a commitment, it's friendship taken to a whole new level. This applies to guys as well. Dear Babe, I LOVE You ! You know I never get enough of you, I love you so much, I love everything about you, just everything never felt so right like this before. Yes you're the one I've been waiting for my whole life and I wanna spend the rest of my life with you, only you, I love you, babe, life is beautiful babe, when two hearts love each other so much and when two hearts understand each other so much, you're my reflection and I am your's & we are surely Twin Flames. We have so many similarities and so much of differences and yet we love each other so much, I imagine us being together every day & I am excited, impatience & overwhelmed to be with you soon. No matter how much I'll have to wait, I will surely wait & no matter how much distance between us. I will cross them all to be with you. I love our long conversations especially at night when the whole world is sleeping and the silence of peace and all I want to hear is your voice & all I want to hear if your breath and all I want to see is you, only you, My love for you is endless & unconditional. I wish I can show you how much I love you. I wish LOVE can be measured but I can surely tell you that I love you more than the water in the ocean, more than those uncountable fishes in the ocean and more the depth of the ocean. People Say I love you to the moon and back, I would say I love you to the galaxies and back & beyond that. But I love you and will love till the end. HEY ! CAN I SAY YOU SOMETHING TODAY ? One day if you’ll ask me what I see when I look at you, I’ll tell you I am so overwhelmed that I find you like the most caring and lovable person. I’ll look at you like a small boy who looks up for the best item he has right now. I’ll hold your heart in my both hands cupped, ever so calmly. Keep it close to my chest like the circulation blood was my own. Like taking care of you was the ultimate reason stars had to die to give life to this soul of mine. Believe me when I tell you that your hands will never be null of anything. I’ll provide you with more love than you know what to do with these. Everything inside me will always be for you only. The words “alone and all boys are the same” will become extinct from your vocabulary. I will be always there when you need a person to hold her hands and fight for the world. You can confess your daily headaches, every crime, your every sin, to me. You can tell me what makes you go angry and what bothers you. I will immortalize you with my words, paint you in ways no muse has been in history. I will trace verses of poetry on your back from rib to rib each night before you fall asleep. When I write, it’ll be like I long since buried any metaphor that came before you. I will touch you like the softness of wind blowing through your hair as love. Like we’re two wildfires that can’t be put out. Like the world could be ending and I couldn’t stop. I will never leave you rather than I will love you until you give me a reason not to. And when I leave, I will leave you like I never loved you. I will leave you when I realize the worst thing you could have ever done was against my heart. I’ll leave you Loudly and not fast enough. Yet, I will leave you the way a snake sheds its skin, slowly and quietly. I will be somebody differently entirely. You won’t recognize me. It’ll be like you never touched me. My leave will be hell for you. The nights will feel threatening, heavy, and a little bit haunted by my memory. You’ll start to hear my words in your daydream where you will need the motivation to wake up. When I leave, I will not only take the key with me, I will take every copy, throw them in flames and scatter the ashes. You’ll start to miss a place you cannot run back to. You will think of a home you lost the directions to get to. When I leave, I leave for good. You will look up at the sky, see the moon, but still feel like it disappeared with me. You will be with another guy but will always remember me like hell. And in this crowd when you will search me back, you will only found my middle finger to salute you. 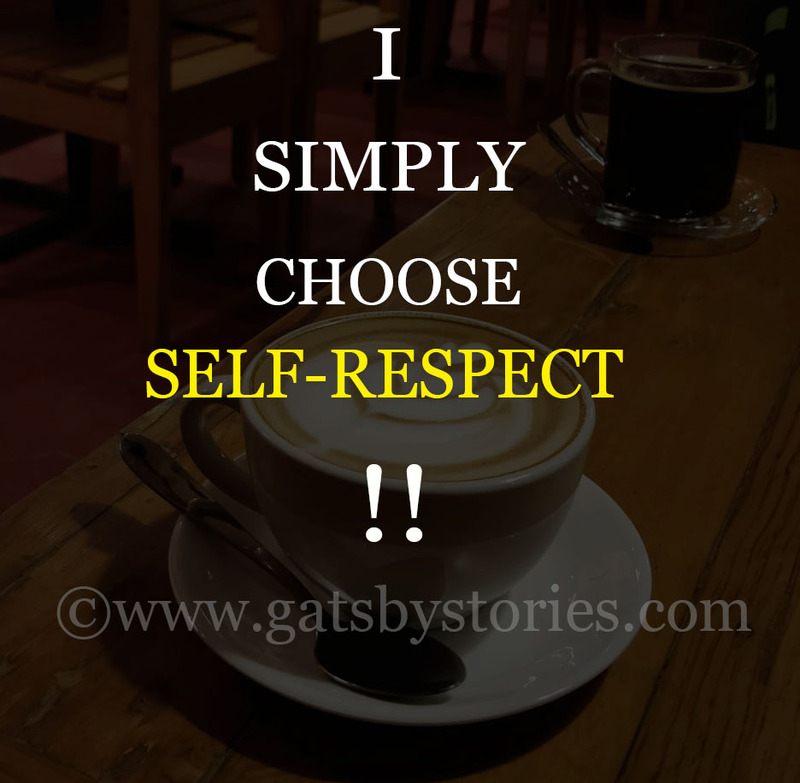 I SIMPLY CHOOSE SELF-RESPECT ! I called 10 times or more than that and sent him 25 plus SMS to convince a 'Friend'. ( I know I have done very much for a friend only). I fought with my one of good friends four months back because of some misunderstanding. I have written a line to him in a mail which meant something else and he took it something else. Kind of miscommunication took place again. 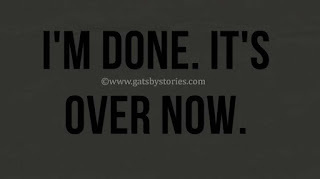 Without informing or giving the reason he stopped talking to me. I realized it after three days when he wasn't picking up my calls and didn't reply to my SMS. 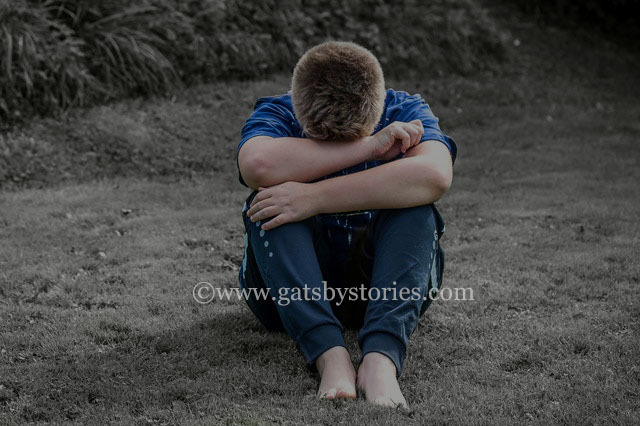 He got completely disconnected with me from a virtual life so-called social media and real life as well. I did, I apologized, I admitted my mistakes, I gave me every bit to save that friendship. But nothing fruitful came out. But After a few days of insisting, "he messaged me by himself, "I will talk to you by myself. Since it's been four months there is no call, no message, no any chit chat, no any coffee talk, no any gathering. I always got a reason behind not calling," I was busy”. Okay, I agree. Everyone is busy who's not? Remember, people make time for whom they want to make time for. We text, call, reply and want to be connected to the people we want to talk to. If you don’t get a response from someone it’s because they have deliberately chosen not to give a response to you. That actually means they are done with you. Accept that as soon as possible. The best thing to do here is to let them fall away from your life. Let them get rid of your life and accept the lessons that they’ve taught you about who you are and what you want in life. But never waste your precious time without admitting your mistakes and faults. Probably I would never ever do now for anyone in the future. I would never get cheated by anyone by their fake trustworthy words. As with anything in this life, there are people who will try to take advantage of your good nature and behavior. There are people who will try to use your wealth of time. They will use your trust for their better life. If you will ever do, be in limits. If you ever stuck in a situation of choosing a person or self-respect, trust me, if you don't want to regret, choose later one. Because that person will never put you in such a situation. If you choose to that person that feeling molest you patchily at some moments because that person couldn't be the same as he was for you. Self-esteem will be much better as a result because giving a priority for caring about own and family life is a matured thinking. No-one could beat you on a happy and satisfactory life if you are with your own decision. Since that day, I have never gone such an extent to stop someone in my life, it doesn't mean I don't value relationships or friendships. 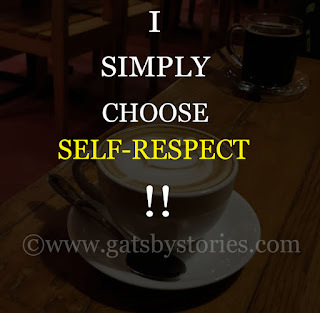 It simply means I choose self-respect. YOU DESERVE TO BE HAPPY ! My friends! You deserve to be happy. Actually, you deserve to be joyful. To giggle. To enjoy. To have your own choices. You deserve a life that is good and meaningful, a life without regrets and a cheerful life with lots and lots of love and respect. Hey you! Listen! I know you are struggling. Sometimes, you feel like you are not special. A life that will bring you meaning. A life that will bring you to a path. I know you think you don’t deserve this. You think you do not deserve to smile. You think you do not deserve to have this life. I feel you are struggling on your pain. You do not want to be sad anymore. You do not want to have tension. You do not want to keep crying every single night and day. But you don't need to be rude. And what I feel is you’re thinking, everything is better than that feeling. But please listen to me, reserve it that, this sadness is temporary as hell. This grief and tension are temporary. This suffering you are experiencing is not forever. It will not affect you daily. It will never stick with you like your human organs. Believe me, you are beautiful. You are something for those who love you. You are the one who chooses to be perfect. So please do not over think that you are nothing. Please do not believe in false judgment. Because you are something special. You can change your life with your own little effort but never get in a trap of illusion. Never judge any people by their face because there are many examples of "Romeo and Juliet" who always focus on better behavior, but fail to get a dashing face. If someone says stop, do not stop. Do not lose hope for yourself. Do not let the depression and the pain take over your every happy emotion. Engage with the people you feel frank with. Share your feelings to friends that you know won’t judge you. Try to make memories with friends because nothing can bring a better smile than memories that you had with someone. Trust yourself, you are not always going to feel like this. You are not always going to feel this dark. Compare yourself with the image that you see in the mirror. Who would want to see that depressed face? Even you will feel that, why am I being sad? Why to live with a sad time if a small smile and happiness could bring a better time for your future life? So please, keep moving. Keep motivating. Keep fighting with the problems. Most precious things you should keep smiling. One day at your old age, when you will sit on the bench in a park, you will remind everything that you have done to overcome those problems and will pose that motivation to inspire others. Take Care, Keep Smiling Because if you have no one I am here to listen to you. It's over for a boy who always wished for others happiness. It's over now to show you that care and love. He has finally felt your all words were fake. He was not expecting but he was trying to make you happy because he wants to, he saw himself in you. But what he gets the same unwanted feeling. He was not expecting anything from you, but love and some frank behavior. He doesn't want to let you down at any cost because he cares about the every situation of you whether they may be bad or wrong. 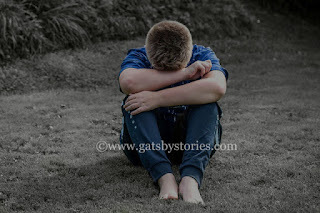 He always lied himself that he had found a better life partner for his life because he is now cheated. He missed the best memories over them with his friends because he had to give time with you. He had left the coffee talk with friends. He had left the photo session with his friends. He had left the most enjoyable moments with friends. It's just because he had set the mind with that he had to give time with you. It's because you were his life. It's because you are the one he wanted to see a happier more than his friends. It's because he didn't want to miss the sweet talk with you which are more tastier than coffee. It's because he wanted to capture the best memory of you on his find than being the photogenic with his friends. It's because he didn't want to leave you alone so that you won't feel lonely and upset. It's because he wanted to make you feel that you have got the best caring life partner ever. The same ignorance every time. He knows you don't want to talk with anyone and you have your own problems. Hold on girl, this guy has many problems than you but he is still considered to make you happy and smiling. He wants too, he chooses you not because of who you are, he is not here to give sympathy, he is not here to play with your feelings, he is here because of he just likes you, he is here because he just likes to talk with you. He waited for your call today, but what you give to him ignorance if it was that why you said "I will not leave you", was that words for you are just a joke. He knows this situation is hard for him because he can be used again. He will be cheated again. But what he knows is he trust you more than himself, but you will not understand you will go back to the same problems who will make you depressed. Now he will not force you, he will not try to make you happy because he is absolutely doomed. He is not alone but he wants your care and support. Darling, it's over now, he tried to make you everything and now what he always gets "Thanks". DEAR EX, YOU'RE STILL BEAUTIFUL ! I WAS WRONG, ACTUALLY ! YOU DESERVE TO BE LOVED ONE DAY !